These pants I just picked up while rushing through the store after I had to return the weekend jeans which had legs that were just way too wide. I've grown way too addicted to my skinny legs, so when I saw something about Genius Fit and Skinny - I snapped up the size 26 - rushed in the dressing room - they fit PERFECTLY and wore them the next day. My skepticism about their claim of "they will never stretch out" was put to rest after a FULL day of meetings and events. Couldn't believe it really. Now I need more colors. Asap. Can't believe I got these shoes for just SIX DOLLARS!!! Nothing feels good like a shoe score. 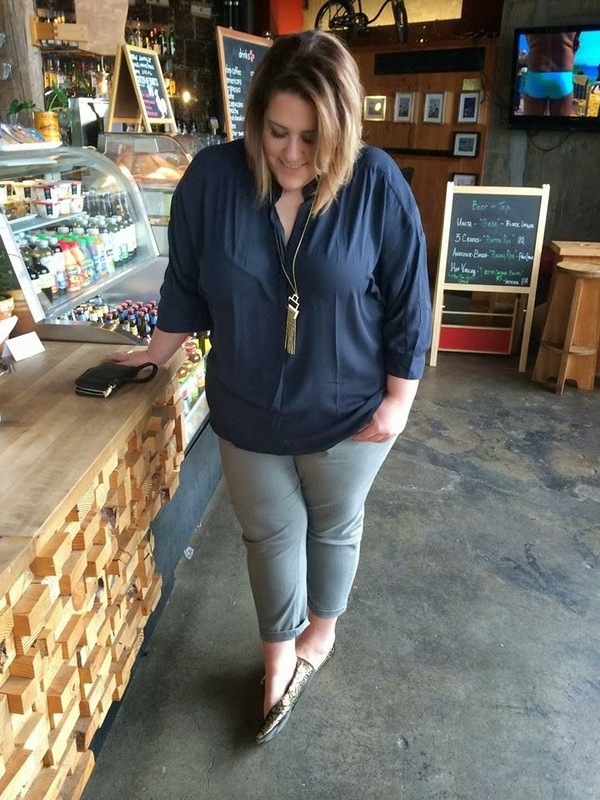 Link to pants: After putting on some weight, I'm bordering on 26/28, but the size 26 fits amazing with just right amount of room. So do NOT size up on these babies. I did do a little roll on the leg, but these are def ankle pants where they do not go all the way to bottom of shoe. Link to top: I'm in size 26/28 and sized up so nice and flowy, but my big bum still made the back bunch around my behind a bit. But, so is life. Love you guys and hope you have a great weekend!